This section provides a summary of the remedial technology selection process. This process is NOT appropriate for emergency response situations. Figure 6-1 illustrates the technology selection process and how it relates to coincidental, ongoing LCSM development. Note that Figure 6-1 assumes the LCSM was developed sufficiently in Section 4 and that all LNAPL concerns were identified in Section 5 prior to beginning remedial technology screening in this chapter. Technology selection is a stepwise and linear process for addressing each LNAPL concern; however, remedy selection is seldom linear. The initial focus in technology selection, therefore, should not be when (i.e., in what sequence) each concern is addressed or step is performed, but rather that each is addressed/performed sufficiently. If all concerns are addressed, then the regulating authority can be confident that a complete remedial strategy is being proposed, and the proposing entity can be confident that the proposal is likely to be effective and acceptable to regulators and stakeholders alike. However, some concerns ultimately may take precedence over others and thus dictate the order of technology implementation. Figure 6-1. LNAPL technology screening and selection coincident with LCSM development. Table 6-1 provides a brief description of each of the technologies addressed in this guidance. The technologies listed are based upon a survey of the LNAPL team’s experience and knowledge; some are more innovative or have a better record of accomplishment than others. Please note that less intensive LNAPL recovery technologies such as the use of adsorbent socks, manual bailing, passive skimmers, or (periodic, short-term) vacuum trucks are not included in the technology tables. These methods generally are not very effective to recover significant LNAPL. However, depending on the expected or measured yield of recoverable LNAPL, these technologies may be appropriate when dictated by local regulations, aesthetic concerns, or emergency response actions not included in this process. Appendix A provides detailed information on each of the technologies presented in this guidance through a series of three tables (A-, B-, and C-series tables) that correlate to the screening process in Section 6.2 through Section 6.4, respectively. Because of the number of potential technology candidates and the wide array of applicability of the technologies, selection of an appropriate technology is multifaceted. The selection process must consider the LNAPL remedial goals in light of the overall site use (current and future), LNAPL remediation objectives, site conditions, LNAPL type, and non-technical factors. Excavation LNAPL body is physically removed and properly treated or disposed. Accomplishes removal and/or reduction of all phases including LNAPL, adsorbed, dissolved, and vapor. Skimming: LNAPL is the only fluid removed using a pump or similar continuous mechanical device. There may be incidental, small volume water recovery. Vacuum Enhanced Skimming: LNAPL and vapor are the fluids removed. LNAPL drawdown via skimming and vacuum induce an LNAPL gradient toward the recovery point. Also referred to as bioslurping or vacuum enhanced fluid recovery (VEFR). Total Liquid Extraction: LNAPL and water are the fluids removed. Drawdown of LNAPL and groundwater induce an LNAPL gradient toward the recovery point. Groundwater drawdown may expose submerged LNAPL thereby increasing LNAPL mobility and recovery rate. Groundwater extraction may also provide hydraulic containment of potentially migrating LNAPL. Also referred to as dual pump liquid extraction (DPLE) (ITRC 2009a). Multi-Phase Extraction (MPE): LNAPL, water, and vapor are the fluids removed. LNAPL drawdown, groundwater drawdown, and vacuum induce an LNAPL gradient toward the recovery point. Groundwater drawdown may expose submerged LNAPL thereby increasing LNAPL recovery rate. Groundwater extraction may also provide hydraulic containment of potentially migrating LNAPL. Also referred to as dual-phase extraction (DPE) or two-phase extraction (TPE) (USACE 1999). MPE is also often used as a phase-change technology to expose submerged LNAPL (as well as LNAPL in the vadose zone) to volatilization and enhanced aerobic biodegradation with hydraulic LNAPL removal as a secondary remediation objective. Water flooding (incl. hot water flooding): Water is injected to enhance the LNAPL gradient toward recovery wells. Hot water may be injected to reduce LNAPL viscosity and interfacial tension and further enhance LNAPL removal by hydraulic recovery. Surfactant-enhanced subsurface remediation (SESR): A surfactant is injected to decrease interfacial tension and increase solubility. LNAPL and water are recovered hydraulically. Cosolvent flushing: A solvent is injected to increase LNAPL solubility and mobility. LNAPL and water are recovered hydraulically. Steam injection: LNAPL is removed by forcing steam into the aquifer to vaporize and solubilize LNAPL, increase LNAPL recovery by reducing the viscosity and interfacial tension of LNAPL, and enhance LNAPL gradient. Vapors, impacted groundwater, and LNAPL are recovered via vapor extraction and hydraulic recovery. Thermal conduction heating: Soil is heated using heating elements to vaporize and solubilize LNAPL and increase LNAPL recovery by reducing the viscosity and interfacial tension of LNAPL. Vapors, impacted groundwater, and LNAPL are recovered via vapor extraction and hydraulic recovery. Electrical resistance heating: Electrical current is used to heat soil and groundwater through subsurface electrodes to vaporize and solubilize LNAPL and increase LNAPL recovery by reducing the viscosity and interfacial tension of LNAPL. Vapors, impacted groundwater, and LNAPL are recovered via vapor extraction and hydraulic recovery. In situ smoldering: Initiated through a short duration, low energy “ignition event.” Combustion is sustained by the addition of air through a well to the target treatment zone. The energy of the reacting contaminants is used to pre-heat and initiate combustion of contaminants in adjacent areas, propagating a combustion front through the LNAPL-impacted zone in a self-sustaining manner, provided a sufficient flux of oxygen is supplied. Air sparging/ soil vapor extraction (AS/SVE) AS injects air into the saturated zone to solubilize (turbulence), biodegrade (aerobic), and volatilize LNAPL constituents from the submerged and overlying portions of the LNAPL body where airflow occurs. SVE also enhances aerobic biodegradation and volatilization of the LNAPL constituents from the vadose zone and collects vapors created by AS. AS or SVE can also be used individually if conditions are appropriate. A significant portion of the LNAPL depletion accomplished by AS/SVE is due to enhancement of aerobic biodegradation. Depletion of LNAPL in the vadose zone is enhanced by SVE because it can draw continuous LNAPL from the saturated zone into the vadose zone via capillary processes (wicking). Biosparging/ bioventing Similar processes to AS/SVE, except air/oxygen is injected more slowly with the main goal being stimulation of aerobic biological degradation of LNAPL in the saturated and unsaturated zones. Various configurations are possible including inducing airflow into the unsaturated zone by extraction of soil vapors. In situ chemical oxidation LNAPL is depleted by enhanced solubilization and chemical destruction through the addition of a chemical oxidant into the LNAPL zone (e.g., hydrogen peroxide and persulfate). Chemical oxidation typically requires the addition of catalysts, stabilizers, and/or activators to control the rates of oxidation. Oxidation reactions with LNAPL can be vigorous and require controls for off-gas, for example. Enhanced anaerobic biodegradation Enhanced anaerobic biodegradation involves supplying electron acceptors other than oxygen (e.g., nitrate and sulfate). Anaerobic biodegradation can also be achieved by increasing the subsurface temperature to increase natural biodegradation rates. Natural source zone depletion (NSZD) LNAPL is degraded via naturally occurring processes of biodegradation, volatilization, and dissolution. The predominant process is biodegradation, including direct LNAPL-contact biodegradation. LNAPL constituents dissolve, biodegrade, volatilize, solubilize in soil moisture, and also subsequently biodegrade in the vadose zone. Biodegradation produces gaseous products, such as methane and carbon dioxide and ultimately completely mineralize the LNAPL. Activated carbon Activated carbon with electron acceptors or chemical oxidants is injected or placed into excavations to enhance biodegradation or destruction processes. The activated carbon adsorbs organic compounds and provides a substrate for biomass growth. The added reagents support enhanced (aerobic or anaerobic) bioremediation or destruction by chemical oxidation. Phytotechnology Phytotechnologies use plants to remediate or contain contaminants in the soil, groundwater, surface water, or sediments. Phytoremediation is generally considered a phase-change technology, enhancing subsurface biodegradation, but, to a lesser extent, can also be considered mass control technology if designed for hydraulic control. Physical or hydraulic containment Subsurface barriers (e.g., sheet piles, French drain, slurry wall, groundwater extraction, trenches, and permeable absorptive barrier) are constructed to prevent, impede, or divert LNAPL migration. It is generally a mass control technology and does not significantly reduce LNAPL mass. In situ soil mixing (stabilization) LNAPL is immobilized by reducing the permeability of the LNAPL zone through in situ mixing of amendments (e.g., addition of bentonite clay or cement). In addition to reducing LNAPL mobility, it also reduces the leachability and volatility of the LNAPL constituents. 1 – Enhanced aerobic biodegradation is not listed in this table separately because aerobic biodegradation occurs during many of the other technologies including all aeration methods and ISCO. View Table 6-2 in Adobe PDF format. As shown on the upper right side of Figure 6-1 (modified from Figure 4-1), the technology selection process begins with a preliminary screening of LNAPL and site conditions as described in Section 6.2. The user will first screen the technologies based on their potential to achieve the LNAPL remedial goals and objectives given the general site and LNAPL conditions. Table 6-3 rearranges the technologies by applicability to LNAPL goals and objectives. Leaving Section 6.2, the user will have a shortened (screened) list of technologies that have the potential to achieve the LNAPL remediation objectives, given the geologic conditions at the site. Further evaluation of screened technologies is performed using Section 6.3. Table 6-4 and the B-series tables in Appendix A list miscellaneous technology evaluation factors (including remedial timeframe, public concern, carbon footprint, and site use) that carry varying degrees of significance with respect to the site and to stakeholders in choosing a final technology to implement. The final evaluation step is to select a technology based on engineering data requirements. Section 6.4 and the C-series tables in Appendix A will assist the user in recognizing the critical site-specific requirements that must be evaluated, along with the Design and Performance LCSM, for selecting the final technology(ies) and establishing LNAPL remediation milestones and performance metrics. Although it is beyond the scope of this document, technology implementation (i.e., construction and execution/operation) is important. First, even if the proper technology is selected, poor implementation will guarantee non-optimum performance and increase the likelihood of technology failure. It may not become apparent to stakeholders until later that implementation, not technology selection, was the reason for failure. Second, there is often more than one way to implement a technology (e.g., horizontal vs. vertical wells; constant vs. pulsed system operation). When dictated by site-specific needs, creativity and innovation by the environmental professional, contractors, and vendors are critical to remedial success. Consider LNAPL remedial goals and LNAPL remediation objectives to generate a reduced list of feasible LNAPL remedial technologies (see Table 6-3). Table 6-3 is a restatement of technologies from Table 6-2 in relation to remediation objectives and goals. This table has the advantage of providing the user with technology choices or alternatives to address specific concerns and is critical to screening technologies. Examples of possible performance metrics are also provided. The potentially applicable technologies listed in Table 6-3 are limited to those most likely to be selected from, in the opinion of the ITRC LNAPL Team. Other technologies may be conceptually applicable; however, they are considerably less likely to pass screening and are not listed. Revisit the LCSM to collate data and, as necessary, collect additional site characterization data that will be used in Step 3 to screen out technologies that are not likely to be effective for the geologic and LNAPL conditions specific to the site being evaluated—and, in Section 6.3, to further screen out technologies that are likely to be more difficult to implement due to other site-specific factors. Take the results from Steps 1 and 2 and, using Appendix A tables, apply site-specific geologic and hydrogeologic characteristics to focus the list of applicable remedial technologies. Figure 6-2. Process overview of Steps 1 through 3. View Table 6-3 in Adobe PDF format. 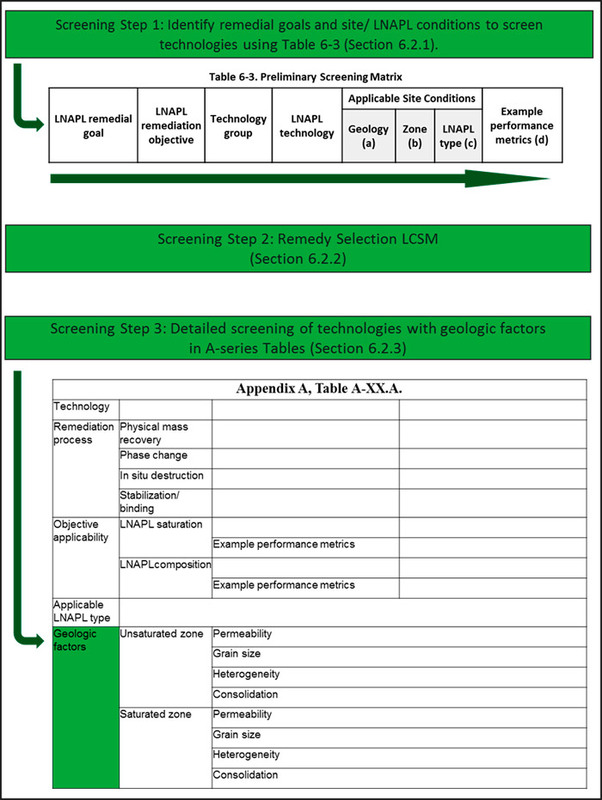 The screening process begins with the first (left) column of Table 6-3, which lists LNAPL remedial goals covering the typical spectrum of site-specific LNAPL concerns. The user should note that some remedial goals might have more than one LNAPL remediation objective (column 2), which means more than one technology can be utilized to achieve the identified remedial goal. The remediation objective is basically a restatement of the remedial goal in the context of remediation technology. The Technology group (column 3) describes the general method by which the remediation objective can be achieved. A suite of potentially applicable technologies (column 4) is associated with each LNAPL remediation objective. Applicable site conditions (columns 5, 6, and 7) assist in choosing a technology. Repeat the procedures above for each applicable LNAPL remedial goal. You may find that some technologies already identified are capable of addressing more than one LNAPL objective. The LNAPL technologies that pass Step 1 will be further evaluated in Step 3. The Initial LCSM that was developed through the application of questions in Section 4 was sufficient for identification of LNAPL concerns developed in Section 5. However, at this point, the user may find there is not enough information available from the assessment phase to continue the technology selection process. For example, it may be that the lateral extent of LNAPL is defined, but the vertical distribution is not. This is where the Remedy Selection LCSM becomes important, and the questions in Section 4.4 should be answered. The key aspect of this step is to assess additional site-specific parameters to further screen technologies. Screening Step 3 uses the A-series tables provided in Appendix A to further screen and eliminate technologies that fail after a more detailed assessment of technology-specific factors. For some technologies (e.g., excavation, some heating technologies), geologic factors do not affect the suitability of the technology; however, success for other technologies may depend significantly on certain geologic conditions being present at the site. For example, ISCO and enhanced anaerobic biodegradation may not be a primary technology choice when soils are impermeable or highly heterogeneous. Technologies carried forward from Step 3 will be evaluated as explained in Section 6.3 and Section 6.4. 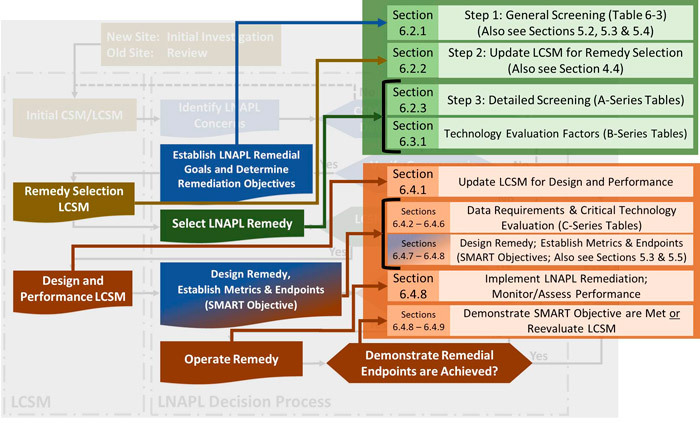 If no remedial technology passes by this point, repeat the process for Step 1, but select a different LNAPL remedial goal. If no technology can be identified to achieve the required objective, consider discussing this outcome with the regulatory authority (see Section 6.3.2). After the user has completed Section 6.2 and identified a list of technologies (at least two) that are applicable to the site, these technologies are further evaluated to identify which might be successfully implemented at the site. Preferences for specific remediation objectives may be apparent upon reviewing the list of applicable technologies. Alternatively, if the most suitable remediation objective is not apparent from Section 6.2, then review of additional evaluation factors may clarify which remediation objective is best suited. Then the user can return to Section 6.2 and complete the initial technology screening process. Table 6-4 provides nine factors specific to LNAPL remediation to consider when selecting key evaluation factors for the project. Based on the LCSM and remediation objectives, identify a short list of factors (typically four to six) that are likely to be most relevant for technology selection. To ensure acceptance of the technology selection process, this set of factors should be selected in consultation with all of the site stakeholders. Once a set of factors has been determined for the project, the B-series tables in Appendix A should be reviewed for the screened technologies from Section 6.2. These factors should be considered for each technology in the short list to confirm that the technology is feasible for the project. Figure 6-3 provides an example of this evaluation process for excavation. Remedial timeframe Defined The timeframe by which the LNAPL remediation objective is to be met. The timeframe may be a regulatory or non-regulatory evaluation factor. Any one LNAPL remediation project may have different timeframes to meet different LNAPL remedial goals or remedial objectives. Impact Holding all other variables the same, the shorter the timeframe, the more aggressive the effort required, which often increases costs. For a given technology, the time required to meet an end point increases with the size of the LNAPL body unless the remediation system scale increases. Increased permitting requirements for one technology over another increases the time that lapses before technology implementation. Increased infrastructure/site barriers commonly slow technology implementation because of the need to avoid infrastructure impacts and compensate for barriers. Safety Defined Safety issues at a particular site that may present a particular challenge to a technology, and safety considerations unique or particular to a technology. This guidance presumes that all construction activities will be in compliance with Occupational Safety and Health Administration (OSHA) health and safety requirements, and that system operation will be within applicable regulations. In addition, it is presumed that any engineered technology has inherent basic safety issues, but the technology may involve the addition of electricity, heat, or chemicals that may pose a particular operational risk if applied at large field scale or in close proximity to workers or the public. Published accident rates for the construction or operational activities may suffice for screening. Impact Safety considerations at urban and rural sites may be different or more intensive. At public access, non-restricted access facilities, it may be more difficult to reliably manage safety issues. Infrastructure issues may be more critical for certain technologies than others. Some technologies may produce waste streams or conditions that are particularly difficult to manage at a particular site or that potentially escalate quickly to a critical state. Waste stream generation and management Defined Level of effort required to manage any waste stream from the remediation. Impact Increased permitting generally increases the time before a technology can be deployed. Waste streams may be more toxic or more difficult to control than the parent LNAPL. Larger waste streams present more of a challenge for disposal or treatment and on-site management pending disposal or treatment. Community concerns Defined Concerns expressed by the community, nearby homeowners, civic organizations, elected officials, or concerns that are likely to be expressed as the LNAPL remediation progresses. The technology poses a particular societal risk. The completion of the remediation causes more harm than good or renders a site less fit for active and productive use or reduces the existing level of ecological use. The LNAPL remediation is applied to public lands possibly controlling the degree or timing of public participation or requiring additional permits (National Environmental Policy Act). The remedy is not, or is not perceived to be, consistent with current and future planned land use, reducing property value or use. LNAPL site is in close proximity to sensitive receptors. LNAPL technology is particularly vulnerable to environmental justice considerations. Environmental factors (carbon footprint/ energy requirements/ waste generation) Defined Resource (e.g. energy and water) usage and availability, and waste generation (amount, toxicity and treatment/disposal) options. The energy usage or waste generated is disproportionate to other technologies. An energy source is not reliably or amply available to power the technology as required. Natural passive energy sources (solar, wind) can power the technology adequately. Impact Site restrictions and limitations impact the implementation of some technologies more than others, due to equipment size, degree of surface disruption, etc. At sites with more potential physical, logistical, or legal site restrictions, the physically larger, more “disruptive” technologies may be less feasible to implement. LNAPL body size Defined The three-dimensional limits (volume distribution) of the LNAPL body. Impact The larger the LNAPL body, the larger the scale of remedial effort required. The feasibility of some technologies may be limited to small-scale application, while others are more feasible for small- and large-scale application. Treatment of larger sites may be complicated by access limitations, physical barriers, cost constraints, or technology limitations. Regulations and permits Defined Some technologies require specific permitting to deploy (e.g., underground injection control [UIC], air, waste management, remediation, maximum available air control technology [air emissions], or OSHA compliance). Impact The greater degree of the permitting required for technology deployment, the higher the costs and more likely the delays to system deployment. Cost Defined Monetary value of expenditures for supplies, services, labor, products, equipment, and other items purchased for both implementation and operational phases. (a) These factors are used in the B-series tables in Appendix A. Some factors are weighted High, Moderate, or Low. “High” means the technology has high sensitivity or contribution to the factor. “Low” means the technology has low sensitivity or contribution to the factor. Figure 6-3. 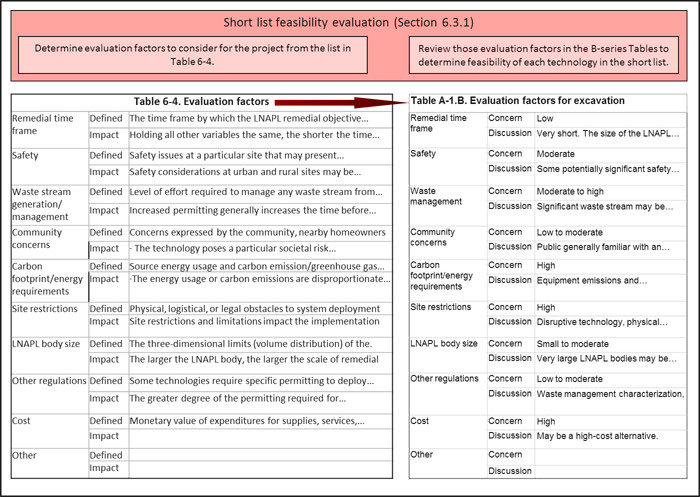 Evaluation factors for determining feasibility of technologies: example for excavation. At some sites, evaluation using the available remediation objectives and the selected key factors may result in elimination of all retained technologies. In these cases, the user either identifies additional technologies for evaluation, modifies the remedial goals so that one or more technologies are retained through the evaluation process, reconsiders the evaluation factors, and/or seeks guidance from the regulatory authority. For example, if no active LNAPL remediation technologies can achieve all of the remedial goals, then risk mitigation may need to be addressed through the use of controls (i.e., administrative, engineering, and/or institutional) in addition to or as an alternative to active remediation. Alternatively, one might consider a combination of technologies that might collectively achieve the goal. evaluating remedial progress toward those goals. This section describes these minimum data requirements. The C-series tables in Appendix A describe the data requirements for each technology in more detail, to the extent information is available. Coincidentally, the LCSM should again be reviewed to identify data gaps and the need for additional site data to further technology selection. Information provided in this section does not replace the services of qualified professionals in the technology selection, engineering, and evaluation process. The information provided in this section is designed to support review of site-specific plans and indicate the types of data that are typically used for the required evaluations. Federal, state, and local requirements should be researched and understood by those individuals implementing the technology selection and design. When developing the minimum data requirements and critical considerations for a technology, the mode(s) of action should be considered. For example, multi-phase extraction can function as an LNAPL mass-recovery technology or a phase-change technology. Testing, design, and remedial performance and progress metrics should be developed to assess the mode(s) of action to be relied upon to reach remediation objectives and, ultimately, the remedial goals. Example performance metrics for the different objectives to identify what type of data are needed to evaluate performance for the chosen technology(ies) are provided in Table 6-3 (far right column). Together, the technology group and performance metrics columns (columns 3 and 8, Table 6-3) explain how the LNAPL can be addressed in the context of that objective and how achievement of the objective can be demonstrated. The performance metrics are different for the different LNAPL remediation objectives, but all measure progress toward the LNAPL remedial goal. The goal of implementing a technology is to change subsurface conditions to accelerate depletion of LNAPL beyond the natural rate of depletion (i.e., the rate of NSZD). As technology selection enters the design and performance phase, a detailed understanding of whether and how the remaining screened technology(ies) can maintain intended changes to subsurface conditions is the final check that the technology will be effective and implementable before full-scale installation and operation is undertaken. For a remedial goal requiring a LNAPL mass recovery technology, one of the most important conditions to change is the LNAPL gradient toward the extraction point (e.g., well, trench, etc.). Using the LCSM already developed, consider where in the hydrostratigraphy (position relative to formation layering and the water table) it will be most effective to induce an LNAPL gradient. Inducing gradients in other fluid phases present in the same interval as the mobile LNAPL can enhance the LNAPL gradient. For example, when implementing vacuum-enhanced fluid recovery for a perched LNAPL body, it is most effective to focus the vacuum and soil vapor flow on the permeable layer containing the mobile LNAPL on top of the perching layer. Applying vacuum to and inducing soil vapor flow from layers underlying and/or overlying the mobile LNAPL will not directly enhance the LNAPL gradient. increased temperature in the LNAPL zone to enhance volatility and solubility of LNAPL constituents as well as, up to moderate temperatures, microbial activity, and biodegradation rates. the primary metric(s) of operational performance. Using the existing LCSM to understand how geological heterogeneity and LNAPL distribution will complicate or simplify establishing and maintaining the intended conditions throughout the target zone is integral to this LCSM question. As the LNAPL is depleted, the LNAPL condition(s) in the subsurface will change. The conditions in the aqueous and vapor phases in and around the LNAPL may change too. Some of these changes will directly relate to the LNAPL remediation objectives and the LNAPL remediation endpoints. Some will relate indirectly. For example, when the remediation objective is reduction of LNAPL mobility, LNAPL transmissivity can provide a direct measure, and LNAPL saturation (soil concentration) may provide an indirect measure, of the mobility changes (which are also likely to be subject to a high degree of uncertainty). remediation objectives are met and remediation endpoints achieved. The changing LNAPL condition(s) are the performance metrics by which remedial progress is measured. During remediation, these performance metrics will confirm that the remedial technology selected is appropriate, given its site-specific effectiveness and implementability for the remediation objective. Further, these metrics will provide insight into whether the remedial design is sufficient to reach the intended remediation endpoints. If they indicate that the implemented technology is not likely to be sufficient to meet the remediation endpoints, then reevaluation of the LCSM and remedial technology selection decision may be warranted. However, the first step should be updating the LCSM with the operation and progress information gained from full-scale operation of the remedial technology. Reevaluation of the design using this updated LCSM may reveal that with design, installation, and/or operation modifications, the selected technology can accomplish the remediation objectives and meet the remediation endpoints. The performance metrics of remedial progress will also be used to demonstrate that the remediation endpoints have been achieved. For some remedial technologies, “rebound” may occur after termination of activity. For example, groundwater concentrations may initially be reduced by ISCO and then increase again after all the oxidant is depleted. Similarly, while SVE is running, hydrocarbon concentrations in soil vapor may be low and then increase again after SVE is shut down. Remediation objectives and endpoints should be compared to these rebounded conditions to evaluate true progress and update the LCSM. Understanding the site-specific processes that will cause rebound and a remedial technology’s ability to mitigate those site-specific processes provides additional final technology screening, design, and performance information. Note also that those metrics typically subject to rebound, while simpler to measure, may be the most robust metrics available. In the preceding examples, a more robust metric might be leachability or volatility of LNAPL in soil samples. These would provide a more direct measure of the potential for the LNAPL zone to continue to act as a source for elevated concentrations of hydrocarbon in groundwater and/or soil vapor. The technology(ies) that are selected through the processes in Sections 6.2 and 6.3 require final screening and site-specific testing to confirm the suitability of the technology to the site, the remediation objectives, and the remediation endpoints. It is important to conduct this screening and testing with several purposes in mind, including data collection for full-scale engineering design and site-specific technology testing. Even though considerable effort may have been exerted to get to the point of conducting a site-specific test, it is important to allow negative test results (if any) to prompt reconsideration of the LCSM, the technology, and/or the LNAPL remedial goals. That is, if a test result is unfavorable to the selected technology, then it may be necessary to conclude that the selected technology will not be able to achieve the LNAPL remediation objectives and reach the remediation endpoints. The data collection and testing recommended should allow a 90% design cost estimate to be developed, which is an important step in evaluating the feasibility of a selected technology. Accurate costing for application of the selected remedial technology(ies) may provide a final discriminating factor between technologies or as a go/no-go point for a single selected technology. These basic data are likely to have been collected already as part of the technology selection process. For the most part, these are measurements of site-specific hydrogeological or LNAPL characteristics. The representativeness of the measured characteristics is a factor that should be carefully considered. For example, for the results of a pumping test to be relevant to the design of an MPE system, it should have been conducted in the area where the system will be implemented or in an area where the LCSM indicates that hydrogeologic conditions are similar. Similarly, the coincident effects of two technologies (e.g., air sparging and SVE) on each other need to be assessed; pilot testing each separately may not reveal their interaction. Use of non-representative data may lead to erroneous design calculations. Bench-scale testing of a remedial technology can be an important step toward evaluating feasibility. It can provide initial estimates of important data and parameters for engineering a remedial technology. In general, bench-scale tests are most useful when applied to investigate the feasibility of technologies in which reagent injection or biodegradation is a key element. For example, bench-scale testing of a chemical oxidant provides information about its effectiveness in destroying the target LNAPL constituents, allows estimates of the portion of the chemical oxidant required just to overcome the natural oxidant demand of the soil, and produces information regarding potential occurrence of unfavorable by-products. In this example, if the natural soil oxidant demand is very high, then feasibility of ISCO may be called into question because of cost and deliverability factors (while it may be hydraulically feasible to deliver the oxidant, the oxidant demand may be such that the oxidant is depleted before it reaches all the target LNAPL constituents). Pilot testing a remedial technology provides data to evaluate field-scale application and remedial technology design. In many cases, a pilot test involves collecting more data (spatially and temporally) than during full-scale remediation. For example, SVE system pilot testing includes pressure and soil-vapor concentration observations at varying distances and directions to determine the ROI, which is then used to estimate the SVE well spacing. This expanded data set provides both a final feasibility step and important information for successful engineering, design, and operation of the selected technology. As mentioned in Section 6.4.3, if two technologies will be implemented simultaneously in the same area, pilot testing of the combined remedy as it will be implemented is recommended. Pilot testing is recommended for almost all technologies and can often be implemented as a portion of the full-scale design. It is important to gather data that allow evaluation of whether the technology will perform as expected and is capable of achieving the LNAPL remediation objectives. It is also important to consider what data are needed if computer models (Section 6.4.6) will be utilized later. If it does not perform as expected, the technology and its selection process should be carefully reevaluated, including updating the LCSM and acknowledging the infeasibility of the technology as warranted. While much effort and capital may have been invested in a selected technology to get it through pilot testing, one of the main reasons for pilot testing is to provide a final confirmation of the remedial approach before investing “full-scale” effort and capital. Ideally, the equipment installed for the pilot test (e.g., monitoring wells, injection wells) can be used as part of the full-scale system. In some cases, semi-analytical and/or numerical models are a useful technology evaluation tool. They may be used to assist in a feasibility study for a selected technology, engineering design of a remedial system, remedial progress evaluation, and/or development of metrics for technology application to the extent practicable. Models can be very powerful tools and give relevant insights into the application of a technology. They also have uncertainty, however, that is inherent in the simplifications necessary to implement modeling, such as simplification of the heterogeneity of the actual hydrogeologic system or simplification of LNAPL behavior. Recognition of this uncertainty and appropriate quantification, such as sensitivity studies, allows model results to be used to their fullest extent and, just as importantly, limit their use to what is reasonable. Care should be taken to calibrate the model against known site conditions and site data. Implementation of models, and in particular, implementation of numerical models for simulation of multiphase flow and behavior, is another area where relevant professional skills and experience are considered particularly important. Full-scale design of the selected technology should consider the data and parameters developed during site investigation and bench- and pilot-scale technology testing. The data and parameters in this section of the C-series tables in Appendix A are crucial to a successful full-scale design. Professional expertise (skill and experience) is particularly critical at this stage. As mentioned in Section 6.1, technology implementation (i.e., construction and execution/operation) considerations become important at this point in the process. Practitioners should work with competent and trustworthy contractors and vendors. During full-scale operation of the selected remedial technology, monitoring both the operational performance of the technology and the progress of remedial efforts is necessary to determine the effectiveness of remediation. Thus, it is crucial to establish performance metrics for operations and remediation progress for each given technology prior to full-scale implementation. These metrics are necessary for demonstrating when a technology has been applied successfully, and/or to the extent practicable, evaluating progress toward remedial goals. See ASTM (ASTM 2014b) for additional performance metric examples. Operational performance monitoring allows for efficient and optimized operation of the remedial system/technology. Careful monitoring of specific data (referred to here as operational performance metrics) during technology implementation is important for gauging whether the technology continues to perform as expected. For example, operational performance monitoring for a multi-phase extraction system would include monitoring parameters such as the flow rate, differential pressure and static pressure to verify that these parameters are within acceptable ranges previously determined during previous projects and pilot testing. Performance metrics for remediation progress allow interpretation of the progress toward a remediation objective. If progress appears to be too slow, the design and operation of the remedial technology should be reevaluated, either throughout the site or in the portion of the site where performance is inadequate. For example, if the performance metric of LNAPL transmissivity at the downgradient edge of an LNAPL body does not demonstrate sufficient reduction in the LNAPL body’s migration potential in one particular segment of the body front for an LNAPL skimming system, then additional skimming wells in that segment may be warranted. It is also possible that the segment contains a previously unrecognized preferential flow channel and that skimming will not work in that particular location. Performance metrics for remediation progress may also be useful in determining if and when the remediation objectives and remedial goals have been met. This skimmer example also highlights the importance of reevaluating the LCSM throughout the life of the remedial operations, particularly whenever unexpected data are observed (and results confirmed). A complete and up-to-date LCSM allows the best possible decisions about application and operation of remedial technology(ies) to be made. See ASTM (ASTM 2014b) for additional insights in updating the LCSM. It is important to note that after implementation of a selected technology(ies), the LCSM should continue to be evaluated, particularly if the selected technology is not performing as anticipated and there are no mechanical or execution issues. The effects of remedial efforts on the subsurface (in general) and LNAPL concentrations (more specifically) should be monitored and recorded to confirm efforts are effective. For example, if ISCO fails to meet intended remediation objectives, it may be that unidentified geological conditions (e.g., lithology changes or fractures) or pockets of LNAPL are responsible. Additionally, data gathered from operations should be reviewed for abnormalities if the selected technology is not performing as anticipated, for example, if vacuum from SVE operations is not affecting a targeted area. If these types of situations develop and there is no apparent cause, it should be considered that the LCSM is incomplete or inaccurate and may need to be corrected before continuing. The technologies briefly described in this document have been more fully documented in other sources; some of these sources are listed in a later section of this document. After initial technology selection, it is strongly recommended that these additional sources, as well as others that are available (or become available after this document is published), be consulted. This process will allow the practitioner and regulator to develop a good, working understanding of the technology so that the most appropriate decisions for application of the LNAPL remedial technology can be made.